Watch Korra switch through the four elements and fight enemies in Platinum Games' Legend of Korra video game. The first footage of the Legend of Korra game premiered at San Diego Comic Con via IGN. 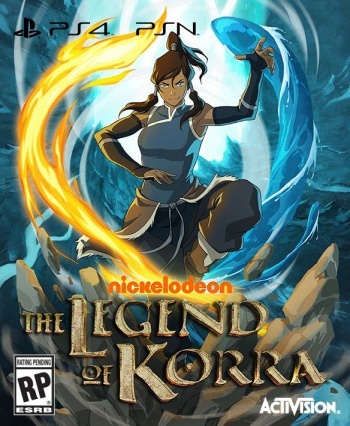 The game takes place in the Legend of Korra universe, starring avatar Korra. As the avatar, Korra is able to control the four elements: earth, fire, air, and water. Korra must keep balance in the world and fight who would do wrong with her bending skills. The Legend of Korra game takes place between the TV series' Book 2 and Book 3, which is currently airing and switching to digital distribution. The game takes approximately four hours to complete, but Platinum Games expects people will play through the game about three times. In the first playthrough players will be able to unlock abilities. In the second, players will interact more with the economy system for items, and the third is a difficult mode for the ultimate avatar. In addition, there is a pro-bending mode where Korra and her teammates Mako and Bolin compete 3-versus-3 against other pro-bending teams. Korra can only equip one element at a time, but rotating through them appears to happen with just a push of a button. Korra will have to be fluid in her movements as she singlehandedly takes down tanks and Equalists. Much of the game is action-based, but there will also be mini-games, such as riding the polar bear dog Naga through Republic City. Legend of Korra will be a downloadable title on PS3, PS4, Xbox 360, and Xbox One this fall.